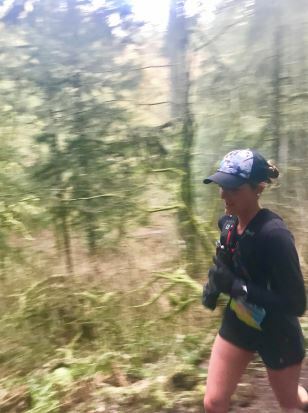 I love the Chuckanut 50k. It was my first ultra and first real trail race. I love the local trails and seeing so many people I know out on the course. 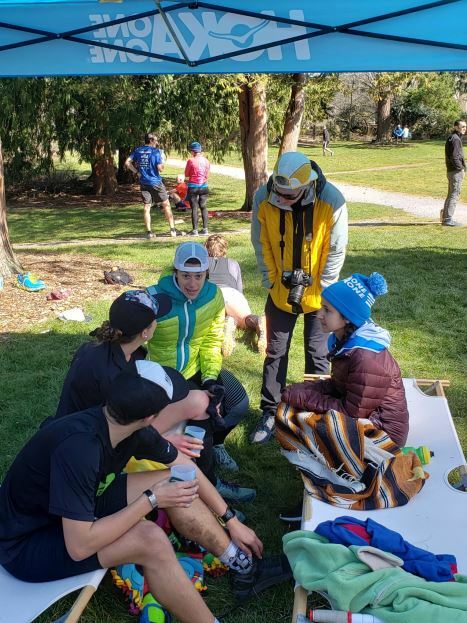 I love the winter training group runs and just repeating the course over and over trying to get better. This year was my 4th go round and I was really hoping to finally break 5:00 (previous times – 5:03, 5:16, 5:01). Training was going mostly according to plan until the snow hit in February, and with the consistent cold temps and higher elevations it just wouldn’t melt. I did a few slow snowy long runs before it all turned to ice and then we ran here and there and everywhere, on all but the course. It’s not that I need to preview the course, I know it by heart, but physically my legs need to know the burn of climbing Fragrance Lake Trail – how to move quickly over the Ridge, how to cruise around Lost Lake. It is empowering to practice specificity. As the race drew closer and the snow was still sticking around, I started to get anxious, real anxious. So many what if’s. What if it’s cancelled, rerouted, requires gear, is icy or snowy? What if I get hurt? Is it better to race or not? Microspikes or not? Practice in the snow or not? Will I need extra fuel? Will I…? In hindsight I should have calmed down at least until I had more answers because I think worrying used up a lot of energy. High school track started a few weeks before the race and between coaching, full time PT work, training, and other commitments, I was running myself a little ragged; worrying about the race kind of pushed me over the edge. Mentally, I wasn’t ready to race. On race day a bunch of pre-existing niggles and injuries decided to come forward. Nothing miserable, nothing I couldn’t run through, just a lot of “well, that doesn’t feel good” and “it’s going to be a long day,” kind of thing. So…the gun went off and we all headed out the Urb – it didn’t take long to realize I should probably be conservative. I got a little bit of momentum on some of the clear sections of Lost Lake and was proud of myself for holding back tears and keeping at it. The mud/slush/snow combination was challenging but had improved so much since Wednesday; I tried to be thankful. South Lost Lake and Chinscraper were mostly clear, and I went back and forth with some other runners multiple times. It’s kind of funny how obvious people’s strengths and weaknesses are. As you pass the comments become “Good job, see ya next downhill” or, “I’m sure you will catch me on Chinscraper!” I get a lot of “You really don’t like technical do you?” I high-fived Tommy who maintained volunteering at the end of the Ridge and told him I was surviving and was going to get it done. I had doubted finishing for most of the last 10 miles, so saying out loud that I could finish felt empowering. Coming down Cleator was a packed snow slush mess so I couldn’t pound the downhill like usual. Trying to stay upright was a challenge and reminded me of glissading. Another runner and I joked about free ski lessons and eventually we hit dry trail part way down Fragrance Lake Road. I did what I could to push the downhill single track and was definitely feeling the best I had all day. I passed teammate Brittney and thought she must have already finished and been back out there cheering (I later learned her day had turned out even more challenging than mine). One final bottle fill at the aid station, and I had 10k of Urb to try to find some redemption for the day. I always think I am going to run the last 10k fast. I love flat, I love the Urb, I’ve run it hundreds of times. The past 3 years I have been so tired from the previous 25 miles that my “hard effort” is really 9 minute miles. 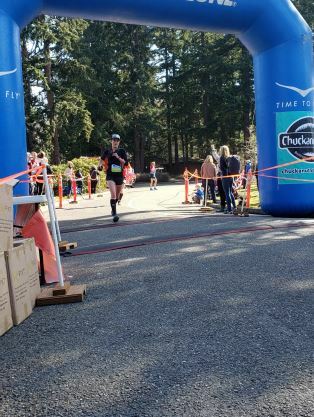 This year was my fastest last 10k – nothing blazing fast but 7:40’s when you are that far back in the pack looks impressive and I got lots of nice cheers. Coming in to Arroyo I caught another teammate, Maxx, and realized that there had been plenty of hard days to go around and that I was definitely not alone in the struggle. We all have different reasons. Too much training, too little, too much intensity, not enough, stomach issues, knee issues, epic bonks, out too fast, too aggressive climbing, falls, injuries, pre-race illness – with so many things that could go wrong, I am reminded how thankful I should be for the days when it all actually goes right. Next Next post: St. Patrick’s Day Weekend Race Results!